An emergency flare that does not produce a flame, smoke, or harmful bi-products and does not require batteries! 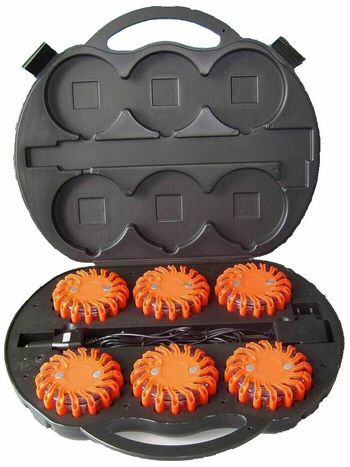 Kit includes 6 LED Emergency Flares in a charging/storage case. Flares will be charged and ready for use when needed. This rechargeable LED Emergency flare offers so many great benefits. Compared to other road flares, the Aervoe LED Road Flare excels in long-lasting durability. We're talking a crush-proof and corrosion-proof polycarbonate plastic exterior and impact resistant rubber housing. What's more, this LED Emergency Falres offers low maintenance with an internal lithium battery that's rechargeable so there are no costly batteries or replacement concerns. This led emergency flares also complies with traffic and safety codes. For example, it meets the U.S. Departmentof Transportation, the Manual on Uniform Traffic Control Devices (MUTCD) andthe National Fire Protection Association (NFPA) standards for traffic safety.And because no smoke vapors, ash, flames, or other harmful byproducts arecreated when in use, the led emergency flares also meets tough state emissionregulations, including California'sVOC emission guidelines.